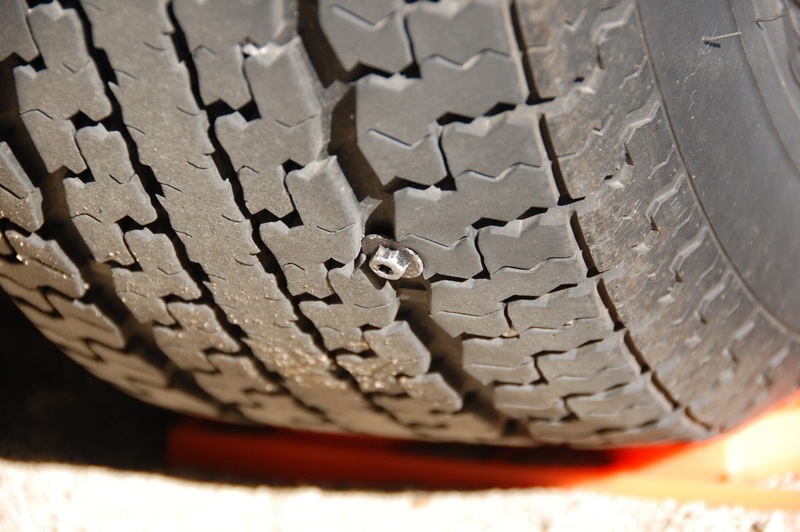 Cold and darkness were rapidly descending as I was completing our trailer unhitching for our holiday camping stay in the desert when I noticed a screw in the Marathon tire as I was placing the tire covers for a long winter’s nap. 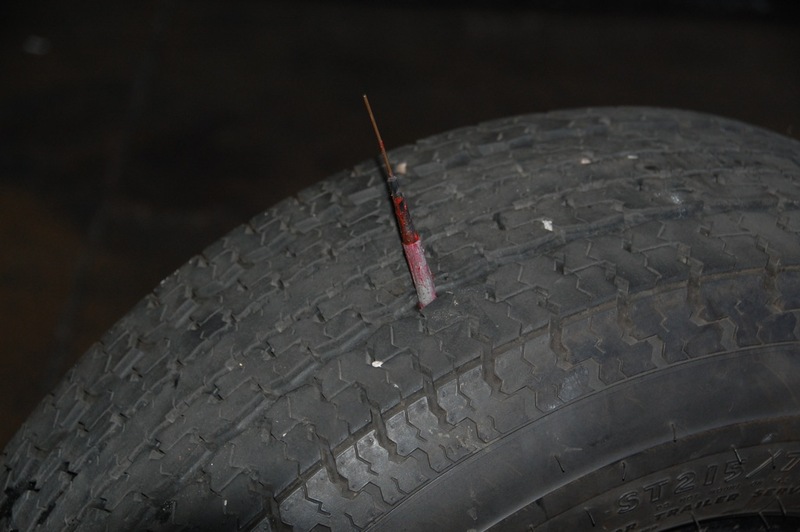 My hopes that the screw did not fully penetrate the tire were dashed the next morning when our PressurePro tire pressure monitoring system showed 21 psi for this tire, which should have been 50. After breakfast, I carefully unscrewed it with pliers and was amazed at its length of 1 inch. It turned out to be a Torx hex washer head self-tapping machine screw* commonly found on automobiles and motorcycles. I marked the puncture site location with masking tape (and later the wheel & drum to make sure the wheel was replaced in the same position per the Airstream Owners Manual). 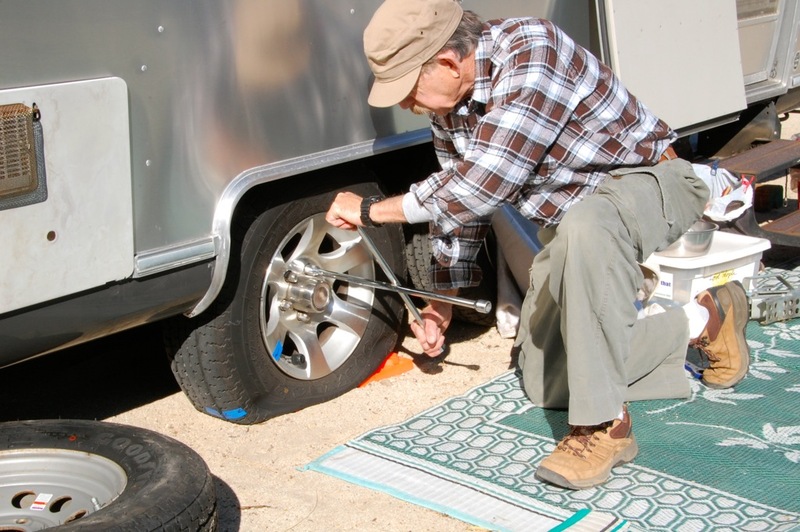 As the tire went completely flat, I consulted The (nearly) Complete Guide to Airstream Maintenance, which has 12 pages devoted to tire care, repair and issues. 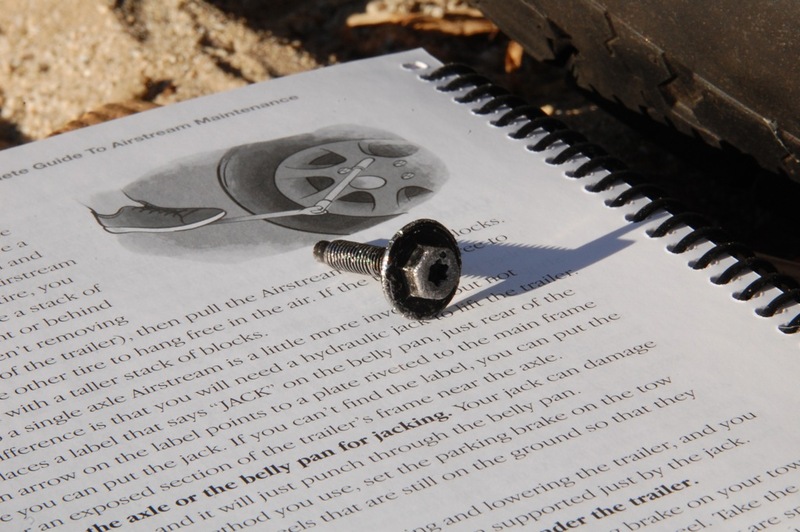 This guide reminded me that when accessing the spare tire,* just pull out the cotter pin and hold up the handle while removing the bolt, rather than doing it the hard way of removing the lower nut and bolt as seen below (which I have done before)! 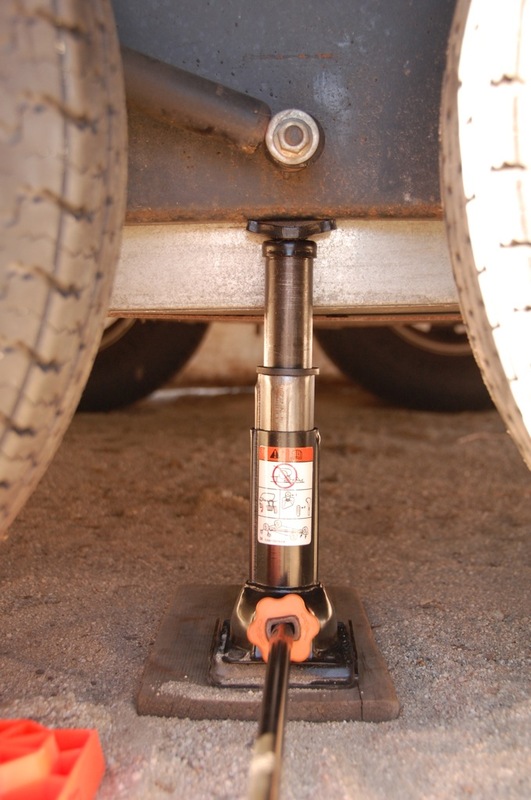 The trailer’s stabilizing jacks were raised before placing the truck jack under the exposed section of the trailer’s frame between the wheels. Before raising the trailer, I made sure the opposite side trailer wheel chock was in place and I loosened the lug nuts with a cross-type 4-way lug wrench that enhances leverage. The trailer was then raised, the flat tire removed, and the spare put in place. I hand tightened the lug nuts before lowering the trailer. Once on the ground, the spare tire lug nuts were then tightened with a torque wrench. 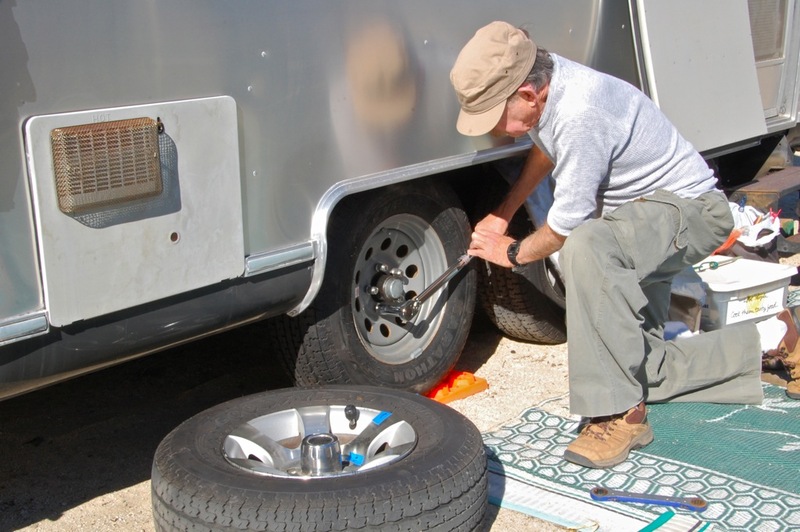 * Our Airstream Owners Manual reminded me to tighten the lug nuts on the spare steel wheel to 95 foot-pounds, rather than 110 for our aluminum wheels, and to recheck the torque at 10, 25, and 50 miles (I rechecked ours at 25 and 65 miles on the way back). Once back in San Diego, I took the flat tire back to where we bought our replacement Goodyear Marathon tires, San Diego Tire & Wheel Outlet. 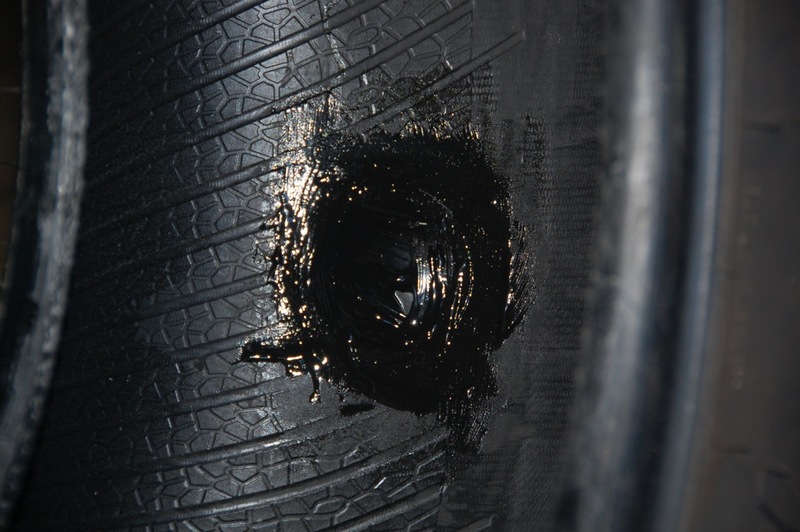 Per the Tire Industry Association,* this tire was repairable because the puncture occurred in the tire crown (and not the shoulder or sidewall) and was not larger than 1/4-inch (6mm), ours was 4.8mm. 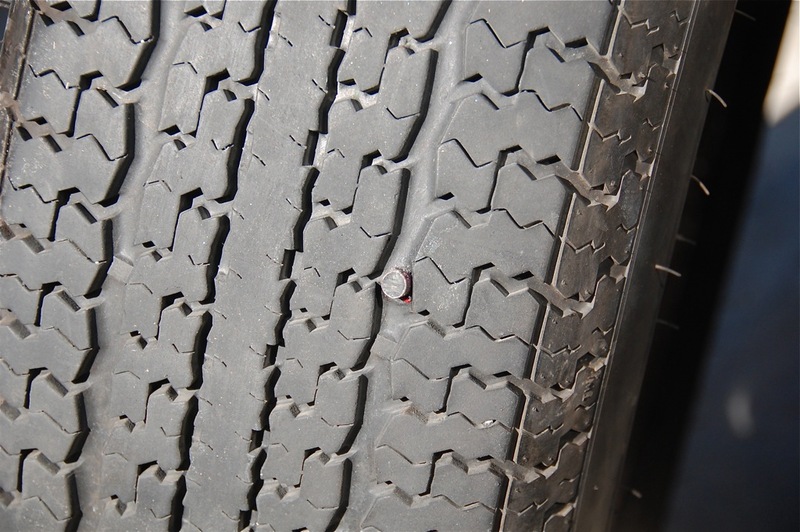 The tire was removed from the rim so that the inside could be thoroughly inspected and repaired. The inside puncture site was prepped by buffing and applying vulcanizing cement and after it dried, a mushroom-shaped patch-plug was applied.